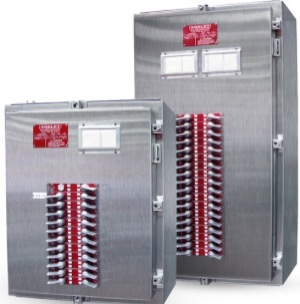 Designed for use in applications where harsh chemicals or hose down conditions exist, the Adalet N4XPB & N4XPBH series stainless steel panelboards provide a watertight, non-corrosive solution for controlling lighting and appliance, power circuits, and power distribution in industrial applications requiring branch power distribution, over current, and short circuit protection. Adalet stainless steel panelboards are available in two versions: A dead front, swing panel version with quick access latches or a through the door operating handle version. The dead front, swing panel version isolates the wiring space, wiring gutter, and termination area which would otherwise be exposed when the door is opened. The external handle version offers the ability to operator the circuit breakers through the door with spring loaded, watertight, aluminum operating handles. Circuit Breaker Operating Handles–aluminum handles (stainless steel handle option available, consult factory) with stainless steel bushings and shafts. V-ring seals, gaskets and sealing nuts provided for water tight seal. Handles are spring loaded allowing for the door to be closed with the breaker toggle in any position.• GFI/EPD handles are colored green and include external test capabilities.